Each year the District celebrates the contributions of a few of the district’s many volunteers. 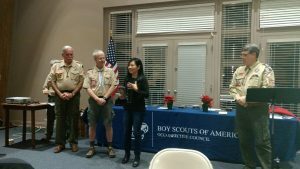 This year, several of the troop’s volunteers were recognised earlier in December for their work within Troop 39 and across the district. 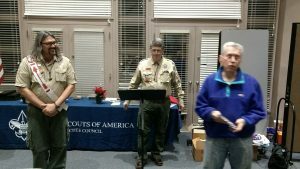 Scoutmaster Emeritus, Mr Jim Mackorell receiving the Charter Organization Representative Award for his work with Troop 505. 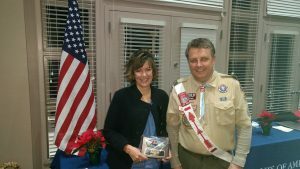 Seen here with nominator Mr Keith Wetzel, Assistant Scoutmaster Troop 505. Sorry about the blurry photo! Ms Julie Hellofs, Touch-a-Truck chair par excellence, receiving the Unit Committee Member Award, photographed with nominator Mr Gary Bird. 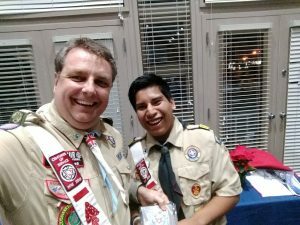 Mr Glyn Tomkins took a selfie after receiving the Order of the Arrow Adult of the Year award from Chapter Chief, Alberto Daniels.